OctaLight is a room light with WiFi. 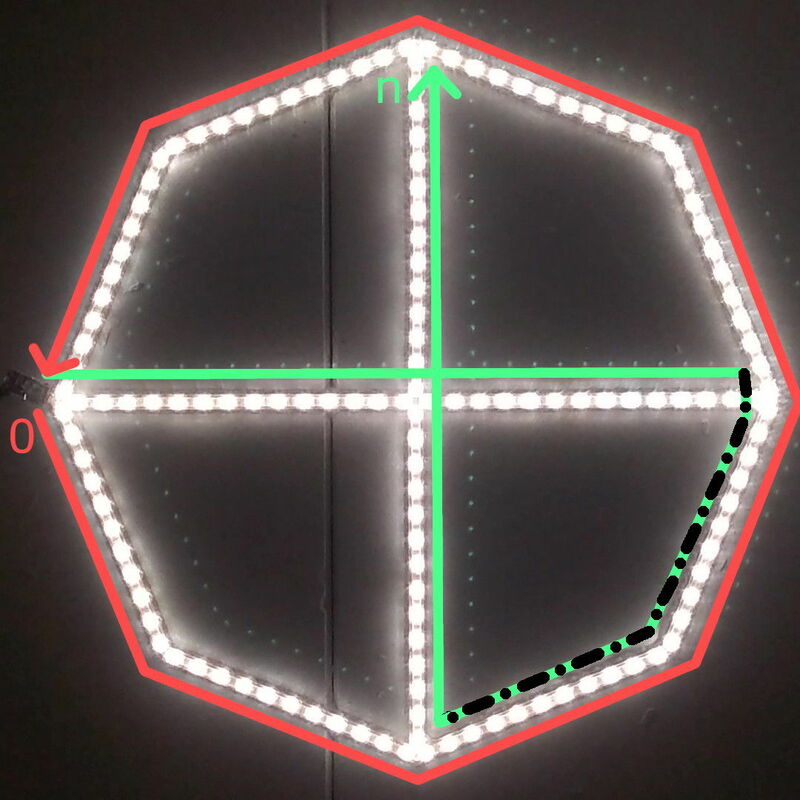 Basically it is an led strip wired in an octagon shape with a cross in the middle of it. It is powered by an ESP8266 chip and has multiple lighting modes and light effects already implemented in the C++ Arduino code. A simple HTTP server is implemented, so the light can react to GET requests. It can also be controlled via the in-built web control panel. You can find the code on my Github repository "octalight". /on Set the light color to a warm white. /off Set the light color to black (off). /color Set the light color. color=[RRGGBBWW] (required) The color. transition=[int] The transition time in ms.
mode=[all | inner | outer] Where to set color. /alternate Alternating circles animation of different colors on the outer pixels. colors=[RRGGBBWWRRGGBBWWRR...] (required) The colors. duration=[int] Duration for one color in ms.
inner=[RRGGBBWW] The color on the inner pixels. cycles=[int] Cycle count. "-1" for infinity. /ripple Ripple animation from in to out of different colors. colors=[RRGGBBWWRRGGBBWWRR...] (required) The colors. /spectrum Waving through the RGB spectrum. duration=[int] Duration for one cycle in ms.
/randomness Random colors on all pixels. frequency=[int] Number of new random pixels per second. /starlight A sky full of stars. color=[RRGGBBWW] Pixel color. frequency=[int] Number of pixel switches per minute. max=[int] Maximum number of pixels on at the same time. /stroboscope Fast-flashing stroboscopic light. colors=[RRGGBBWWRRGGBBWWRR...] (required) The colors. frequency=[int] Number of flashes per second. blacks=[int] Number of black phases between flashes. The ordering mode of the colors. Pixel zero is situated at the controller and the outer pixels (red) range counterclockwise back to it. From there the inner pixels (green) form a bow. Not all the strips can be connected directly: There has to be a cable connection to connect the two inner strands (black-green). NOTE: You can save a lot of money if you buy these parts or some of them on chinese sites like AliExpress.